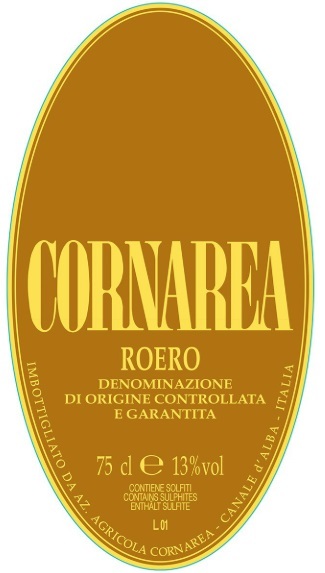 Vinification & Aging: Roero Cornarea is a greatly aged, obtained through a careful selection in the vineyard. It rests for 18 months in big barrels and it continues ageing for at least 6 months in the bottles. Description: Ruby red with granate reflexes. Its perfume is well defined and complex, with a spicy hue and a balsamic eucalyptus aroma. It includes scents of plum, violet, morello cherry and liquorice root. In the mouth it is warm and tasty, with an elegant structure and light tannins. It is pleasant, fruity and mellow, with an elegant and persistent base of berry jam and a mineral aftertaste. Food Pairing: Good pair for red meats, roasted duck, bollito, suckling pig and pasta with truffle.